Money saving coupons on various Advil products.Select your province and print coupons. 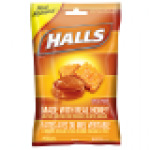 Save $2.00 off the purchase of two (2) Halls cough drop bags (25 - 30 Drops). Save $2.00 off the purchase of one Halls Made With Real Honey bag (30 drops). Save $2 on Robitussin product. Save $5 on any Buckley's product. Save $3 on Advil Cold & Flu or Cold & Sinus product.